The Buddhist hermitage of Taksang?the Tiger?s Lair?hangs precariously to a dramatic 3,000 foot cliff above a dense jungle forest. The white walls of the temple architecture contrast with the deep mountain greens and dark shadows. A nearly thousand-foot waterfall cascading by the hermitage casts a rainbow sheen around the site in the afternoon sun. And the hum of hermits? chant blows down the valley. 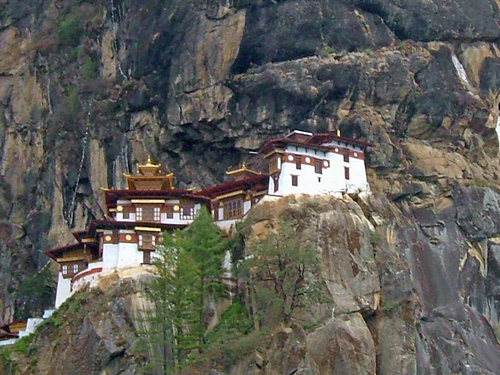 This is Bhutan?s national icon and one of most significant Buddhist pilgrimage sites in all of the Himalaya. Bhutanese and Tibetan pilgrims have journeyed to Taksang for more than a thousand years to pay homage to past saints who have consecrated and imbued the site with blessing. The occasional visit by Bhutanese royal family members over the last five generations have ensured that the shrines and temple roofs were kept in fine shape. Until five years ago, Taksang was strictly off-limits to all foreign tourists. ?For more than 1,200 years, Taksang has been a container of profound blessing,? Khenpo Phuntsok Tashi, Director of the Bhutanese National Museum, says, ?Now with the tourists, there is a danger to the sanctity. Especially if the sightseers come to Taksang carrying the three poisons?desire, anger, ignorance.? In the Buddhist worldview, a physical location can be imbued with and secure blessings. This occurs when powerful masters and yogis practice meditation, conduct rituals, and importantly, make an auspicious connection with the spirits and deities who reside in the mountains, streams and forests. After a site is consecrated in this manner, it is believed to be worthy of pilgrimage for the site has, as Khenpo calls it, ?the existence of blessing.? The physical site no longer is simply a hillside or a stream but rather the topography itself assumes sacredness where the land becomes a support for the inner journey of the pilgrim and meditator. In May of 2010, the World Wide Fund for Nature (WWF), Nekorpa, and Bhutanese Buddhist leaders met at Taksang to study the confluence of traditional Buddhist pilgrimage and conservation. This effort is but one in a growing movement which understands conservation efforts are highly successful when initiated and carried out in concert with faith-based communities. In Taksang specifically, current challenges that the Buddhist yogis are experiencing include not only the increasing amounts of garbage and plastic waste discarded by tourists, but also noise pollution. More significant, however, than garbage, disruptive yelling, and tourists banging on the door of meditators? huts in search of a toilet, is the increasing amount of ?three poisons? that are carried to Taksang. ?Though a site can be imbued with blessing, those blessing can easily be eroded when individuals bring their mental and physical garbage,? Khenpo continued. The recent drying up of a sacred spring associated with Taksang?s principal protector deity, Seng? Sadmdhup, is believed to have occurred because plastic water bottles have polluted the stream. ?Plastic is but a manifestation of greed. Seng? Samdhup is sending us a warning not to throw plastic into the water,?? one monk at Taksang said. WWF and Nekorpa are submitting recommendations to the Bhutanese government, which, among them include waste management tools, but importantly focuses on education of local Bhutanese, for tour guides and operators, and most importantly, for the tourists. The education for tourists will be tied to the government permit process. Suggestions include a one-hour ?course? led by Bhutanese monks to instruct tourists on a pilgrimage ethos to take to the mountain, and ?to carry out what you carry in, leaving no trace.? Such recommenadtions are not limited to Taksang, but indeed should be required for all pilgrimage sites around the world. The case study at Taksang will be featured in a report by the WWF to be released in Nagoya, Japan in October 2010 at the Conference on Biological Diversity. The report features sacred sites, biodiversity conservation and climate change in the Eastern Himalayas. For more information see www.panda.org and www.nekorpa.org.